Your eco baby can start life as a green fashion maven from the get-go with this beautiful collection of organic cotton clothing from Hessnatur! Filled with comfortable, versatile staple wardrobe pieces, perfect for layering and also adorable as separates, this exclusive Eco Baby Hessnatur Organic Clothing Starter Kit is valued at $125 and includes an Organic Cotton Starter Outfit (complete with a romper suit, jacket and cap), an Organic Cotton Wrap Bodysuit (long-sleeved, kimono style wrap available in an array of serene colors) and a 2-Pack of Organic Cotton Rompers (available in sweet light blue/green or orange/rose color combinations.) The lucky winner will get their choice of size and colors to perfectly fit their happy baby. Made in Germany with eco-friendly production standards, Hessnatur clothing is crafted with 100% pure organic cotton by people whose human rights are respected. Started in 1976 by green pioneer Heinz Hess, a father determined to outfit his newborn son in organic clothing which he couldn’t find anywhere, Hessnatur was born of Hess’ desire to design pure clothing in harmony with nature. Hessnatur offers a wide collection of responsibly made clothing to outfit the entire family — and one lucky Inhabitots eco baby will be introduced to this gorgeous collection of Hessnatur’s quality green apparel in today’s giveaway! 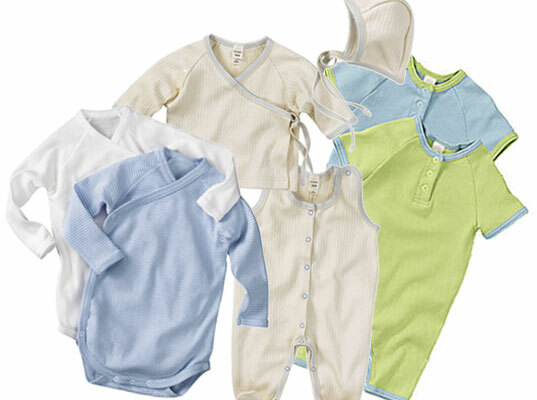 ENTER TO WIN THIS ECO BABY HESSNATUR ORGANIC CLOTHING STARTER KIT! 1) Sign up for our weekly newsletter (if you haven’t already!) We’ll be notifying the winner in our newsletter – so you need to sign up and receive next week’s newsletter to find out if you have won this adorable Eco Baby Hessnatur Organic Clothing Starter Kit! 2) Add a comment to this post with your answer to the following question: Hessnatur maintains the philosophy that people should live in harmony with nature and each other. What part of nature do you hope your baby grows up to appreciate most, and why? Contest ends Sunday, February 7, 2010 at 12 midnight EST. Winner will be announced in next week’s newsletter! Organic cotton is my heart's desire! Would love to wrap my precious baby in this!! I would hope my baby would grow up to love mountains -- particularly the Rocky Mountains, and Rocky Mountain National Park in Colorado, which I visited every summer as a child. I hope my nephew appreciates that giving to nature is as rewarding as taking from nature. I hope my sons grow to appreciate the snow. Both my husband and I are from the north, but are raising our sons in the south and they have not witnessed a true snowfall. What part of nature do you hope your baby grows up to appreciate most, and why? I hope my baby grows up to appreciate all parts of nature. I hope that she recycles, and learns to live as one with the Earth, the animals, and all natural resources. To appreciate all that nature gives us including all its healing capabilities, etc. We are lucky enough to live in the Santa Cruz mountains in California and only about 5 miles from the ocean. We hope that we instill our love and respect for the forest, redwood trees and ocean in our baby. We plan to spend a lot of time at both places with the baby when he or she arrives later this year. I would like my children to grow up with an environment that is free from industrial pollution and the clutter of an overpopulated region. I want them to be able to connect with nature the way that I had when I was growing up; with lush trees, forgotten springs in the middle of the mountains, and to get lost in a night sky night after night. I want my children to be able to pick fresh tomatoes from our garden for an afternoon snack or spend an afternoon picking apricots from our trees, and most importantly, I want them to know how to appreciate it and nurture it. I grew up in Hawaii, so I hope my baby grows up with the same deep love of the ocean that my husband and I share! I hope my baby will understand the scarcity of resources and learn how to use them responsibly-- organic materials and food are a good start! I just hope the little dude is comfortable in wilderness, not just in the park. The freedom of being unafraid and even feeling welcome in wilderness is very liberating and opens up a lot of fun and insight. I hope my baby grows up to appreciate the nature of a wild animal's habitat. Animals are a large part of our lives and I'd like my children to understand that they're not meant to cooped up and restrained whether they are big or small. Their habitat is their home and we need to do all we can to keep it intact so that they may live in peace. I hope that my baby grows up to appreciate the water- the rivers, the lakes, the Gulf of Mexico and the swamps and ponds that make up our area. Most of all, I hope that she grows up to respect the environment that she lives in, every cypress knee and bit of spanish moss, and the miracle that she lives in every day. Respect for animals. I grew up around animals and have a few currently. I hope having the LO around them will teach them to treat them with the respect they deserve. Too few people do now. I hope that my son grows up with an appreciation of all that nature has to offer him. Having grown up surrounded by lush greenery, flowing rivers, fresh air, and everything else that makes our landscape so beautiful, I can't simply pick out one feature. My hope, too, is that he'll have a broader appreciation for all things natural and realize that they are all pieces to a greater puzzle working together. I hope my daughter grows up understanding the interdependency of people and nature. I am expecting my first baby in August. It seems we will be city-dwellers for the foreseeable future, so I hope that my child will learn to always look up at the sky above the buildings, to notice and treasure the plants growing in the sidewalk cracks, and to appreciate where the food on our table comes from, despite being removed from its sources. I hope that we can teach him or her, as we continue to learn ourselves, the bigness and smallness, and the danger and delight, of the forces of nature. I hope my son grows up to appreciate gardening. We grow tons of vegetables as organically as possible in our backyard garden and love to try new crops every year. I hope my son learns to enjoy picking fresh veggies from the garden or eating them from fresh off the vine! My hope is that my son learns that growing his own food is not only fun and ultimately a money-saver, but also a sustainable resource. If theres one thing about nature I hope my child learns, it is to appreciate and value not only nature here, but also the parts of nature in the other regions of the world. My wish is that they understand not only the symbiotic relationship we have with our surroundings, but the relationship others have as well and know how to respect them by educating themselves to make smart decisions in the future. i grew up in the countryside. so i was always playing in the forest and river. i really want my son to know "smells" of the objects in the nature. like i still remember smell of ants and mad, storm, and leaves! I hope that my son learns to appreciate and care for the earth and know that real food comes from the earth, not a plastic tube or bag. I hope my daughter grows to appreciate the wonderful variety that nature has to offer. That one can travel a 1/2 hour or a 1/2 day and see different plants, animals, colors. The amazing variety to be found on our planet encourages such imaginations and awe, that I hope she never loses. Tough question - I really want my son to grow up truly respecting nature (in all forms). If I have to choose, I'd say I hope he understands and appreciates the connection between the earth and himself. We're starting early by him helping with the garden and are adding a couple of urban chickens to our household this spring to help him further get the connection. I hope my baby boy learns to love the serenity and complexity of the outdoors: its sunshine or moonlight, its bird songs or cicada chirps, the warmth of rocks on a sunny day or the coolness of the grass, the wisps of clouds or booming of thunderstorms, the fuzzy animals or the slimy worms... I can hope that he appreciates all of the "small" things in nature because only then, I believe, can he completely treasure and value everything else. I hope my baby grows up to appreciate and respect our local forests and wildlife and be able to live sustainably and responsibly. I hope that they grow up to appreciate Air and furthermore, breath the most. I want them to take notice of the preciousness of life and the air that gives them life. I want them to take advantage of each breath they take so that they never take life for granted, so that they follow their dreams, so that they are happy. Through their awareness that they are breathing a lifeforce, i hope that caring for each part of nature, plants, animals, water, and people comes naturally. I would just love it if my little one grows to appreciate the spark of the Divine in every part of nature and human nature so as to truly live harmoniously on this beautiful earth. The ECO BABY HESSNATUR ORGANIC CLOTHING STARTER KIT would be such a dream to win! Oh how wonderful. Thank you, thank you for hosting this! I hope my child grows up to respect nature and know the value of all it's powers because it knows how to balance itself completely. I hope my baby grows up to appreciate the clean air that we enjoy in our part of the country, so that he/she realizes how fortunate they are and won't take it for granted. Water is what I hope my baby grows up to appreciate... we need clean water and it's my favorite form of recreation too! I hope my baby boy grows up to appreciate fauna and flora. And i am sure he will...... The threatened species and the ecosystem around the world is maybe the most important element in earth's balance. We should all make sure we keep them unspoiled because every distortion effects our lives on the planet earth. We hope that our son appreciates the abundance of food that nature provides. That he is thankful to the effort taken by humans and nature to raise our food, that he is mindful that good food comes from good farming practices and that, if he chooses to be a meat eater, he always eats meat reared in an ecological and kind manner and that he remains grateful to those animals who give their lives over for our enjoyment. I would like my children to appreciate clean air and water-living near a state with many lakes and near a river. we need to keep our water supply clean for health and enjoyment. I get your newsletter. I hope my children can grow up and not take nature for granted. I want them to see the wonder in nature everywhere they go. What a beautiful wardrobe for baby!!! My dream for my baby (due in June) would be for him to enjoy every aspect of nature big and small from the grand mountains to the tiny ants. I hope that he will recognize the complexity of even the smallest organisms and appreciate how everything in nature works together. More than anything I hope my 5 1/2 month old son (and 6 1/2 year old daughter) grow up to appreciate the delicate balance that is our planet. I believe that once one has an understanding of how interconnected and interwoven everything is, from a tiny spec of algae in the ocean all of the way up to the largest land mammals, then one can truly find oneself making deliberate decisions daily that are mindful of our planet and how truly blessed we are to live in such a complex, and delicate, ecosystem. Hoping for a little one at the end of the year, this would be awesome! I love how nature is constantly fixing and adapting to it's environments. It's a lesson on how to deal with life. My in-laws live on a lake. I hope my son grows to be a little fish in the water and really loves visiting his gigi & Grandpa! DIRT! I want my children to be able to roll up their sleeves and dig in the dirt, the mud, sand and the gardens. I want them to dance in rain puddles and bury themselves in the snow. I want them to love the smell of the air after a humid rain; the smell of earthworms and sky. But more than anything else I want them to enjoy the outdoors much more than the in. I would like my daughter (19 months) and my son (due this month) to grow up listening to the natural world around them. Already my daughter tells me about the birds and dogs and bugs she hears when we go outside. I hope her eyes and ears remain open as she grows up to witness the beauty of the world we live in. I hope our children grow up to appreciate how we and all of nature are interconnected. That as they grow up they get out there and experience all of the enjoyment that they can have from the outdoors, which will hopefully create a desire in them to help preserve it for themselves and future generations! I hope my baby grows up to appreciate all types of nature, from Mother Earth to all her animals. Once he gains respect for nature and animals, he'll grow respect for everyone and everything he surrounds himself with. But overall respect is the one thing I hope he gains from appreciating nature. I hope she appreciates how the ocean makes you feel so small and so big at the same time. With all the ways nowadays for children to stay glued to a tv, video game or some other electronic distraction, I pray my children learn to enjoy the outdoors and nature as the best entertainment there is. My husband and I both can remember as children enjoying being outside and spending time in a world of make believe and wonder. I hope to give that to my kids by helping them to appreciate the beauty and excitement of the outdoors and everything that comes with it. I'd like my son to have a respect for nature and the other beings with whom we share this planet. I hope that my baby grows to appreciate the natural woods. They are becoming few and far between. And while parks are pleasant, there is nothing like the forest for discovering the wonder of nature. I hope my baby grows up to respect all of nature and will help keep it clean, free of pollution, and keep people from destroying it. An appreciation for all living creatures & all that nature provides. I want my great-granddaughter, born 24 hours ago, to appreciate the inter-connectedness of nature. I want her to know that we and all of nature are part of a single web of life and that each of our actions affects the whole. I hope my son will also share his father's fascination with insects! i've always felt most connected to the ocean, and i hope to teach my baby girl appreciation for the beauty, diversity, and fragility of this incredible resource. we have so much to learn! I want my baby to grow up appreciating the silent woods. No noise except those proviked by nature: leaves falling, insects moving, birds fluttering. To me, undisturbed woods are the epitome of pure nature. I hope my daughter has a love of fisheries & forestry like I do, and has all the experiences growing up (of camping, hiking etc) that I did. I hope my daughter grows up to feel a connection to the beauty and serenity of the ocean as well as values and appreciates its diversity and does well by its fragile ecosystem. I look forward to taking her to the beach and introducing her to the fun of jumping in waves and swimming in saltwater as well as learning about all of the creatures that live there. I want my daughter to appreciate and help to maintain the interconnectedness of the entire world, but I want her to develop a particular love for the ocean. I want her to experience the fun of jumping waves and collecting shells from a beach that is not eroded or swim in a body of water that is not polluted. I want her to understand that it is part of her job on earth to help maintain the fragile balance of the oceans and to learn all about the diversity of life it supports. I want them to remember that sunsets are one of nature's greatest gifts. I hope my daughter grows up to appreciate water for its ability to sustain life. Thanks! I want my little ones to respect all parts of nature with the knowledge that all of nature's resources are limited and therefore extremely precious. Water is one of the most precious resources at this time. This is just great! What's even better is to see how many responsible and sensible parents are out there! !